I was going to write about mystery cervicals of the Cloverly Formation, but that requires knowing something about juvenile vertebrae and Pleurocoelus, so I decided to write about Pleurocoelus, but that still requires knowing something about juvenile vertebrae. So I’m writing this tutorial to lay the groundwork for more goodness to come. Vertebrae do not spring forth fully formed, like Athena from the mind of Zeus. They grow from bits, and the bits come together at different times in development. The bits themselves start out as anlagen–bone precursors–made of cartilage, and these anlagen start to ossify–turn into bone–at one or more ossification centers. From those centers, the bone grows outward and replaces the cartilage like some kind of science fiction blob monster taking over its host. As the bone replaces the cartilage, the contacts between different bony elements are sometimes left behind as sutures, like the sutures in the bones of your skull. Once the replacement of cartilage by bone is complete, most of the new bone growth happens at the suture margins. This is easy to demonstrate experimentally: if you cut out the suture and glue together the bones on either side, the combined element will not grow to the normal length. Premature suture closure can be a big problem, if the bones that are now fused (say, skull bones) can’t grow fast enough to keep up with whatever is inside (say, a brain). And many of the sutures between skull bones stay open even into old age, at least in humans and other mammals (birds are another story), because sutures also serve another purpose, which is to help the skull respond to mechanical stress without cracking like an egg. However, the eventual fate of most sutures is to close as the bones on either side finally fuse. Some old folks do eventually fuse up most or all of the sutures in their skulls. If you look across the whole skeleton, the closures of different sutures–in the vertebrae, in the long bones, in the limb girdles, in the skull–are spread out through time. This is nice if you want to determine the age at which something–or more often, someone–died (forensic anthropologists get a lot of mileage out of this). But it can also be a pain, because it means that some things are hardly ever found intact. Sauropod skulls are particularly prone to exploding. There are complete, articulated sauropod skeletons for which the skull is either scattered all over the place or simply gone. 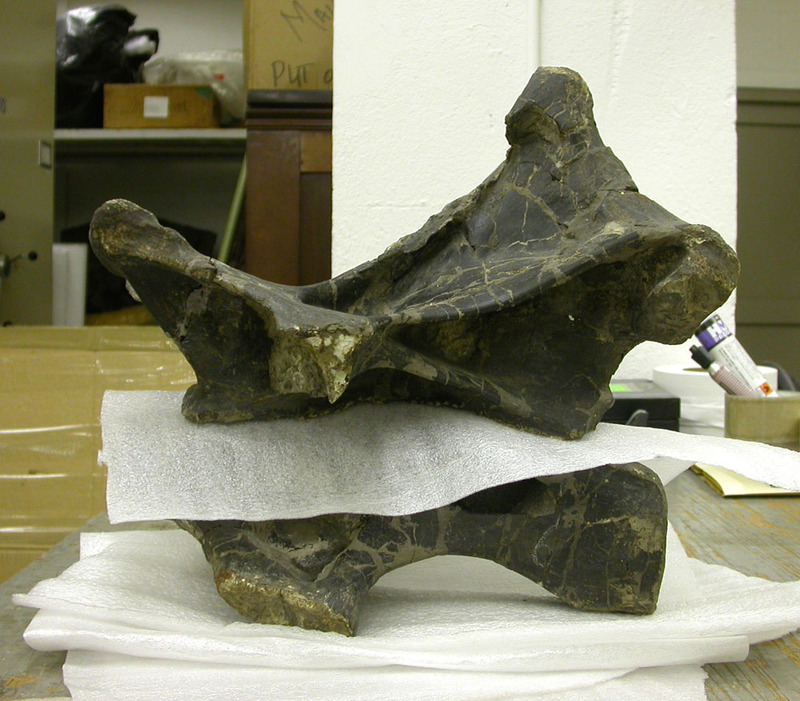 Vertebrae form as several distinct pieces. The centrum starts from paired ossification centers on either side of the cartilaginous notochord (see Tutorials 1 and 2 if you need to brush up on vertebral anatomy). The neural arches also start out as left-and-right paired elements, each of which forms one half of the arch over the spinal cord. The left and right components of the centrum fuse very early in development, and the left and right halves of the neural arch come together later. All of these events can and do fail on occasion. The anlagen may form asymmetrically or not at all, parts may not ossify, and left-right halves can fail to fuse. The best known pathology associated with vertebral development in humans is spina bifida, in which the two halves of the arch and spine fail to unite. The growing spinal cord can stick out through the hole and cause all kinds of problems. I’ll not dwell long on the embryology of vertebrae; there are whole textbooks full of that stuff if you’re curious and some good websites, too. In sauropods, in all of the embryos that have been discovered to date the vertebrae are not yet ossified, so there’s nothing to talk about. Usually in juvenile dinosaurs you find the centrum as a single unit and the neural arch and spine as another (the exception is the atlas, the first cervical vertebra right behind the head, which is so weird that it will have to be dealt with in a separate post). The centrum and neural arch complex come together at the neurocentral sutures, a pair of zipper-like tracts of rough bone (and, in life, cartilage) on either side of the neural canal. These sutures stay open for a long time, usually until the dinos are around half-grown. 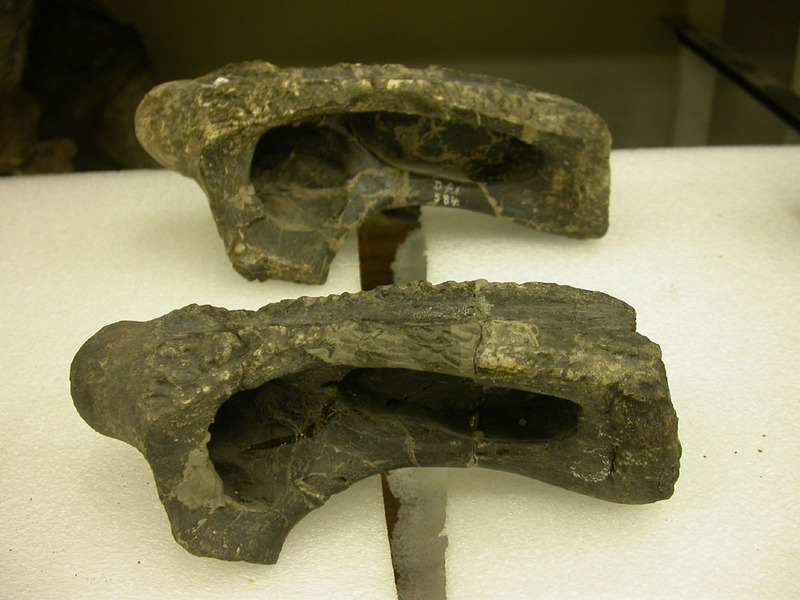 Here are a couple of cervical centra from a juvenile Apatosaurus (in this and other photos in this post, click on each picture to see the unlabeled version). They are facing left, and the giant depressions in the sides are the pneumatic cavities. The centra (C3 and C4 if you’re curious) are propped up on their oversized parapophyses, which are typical for Apatosaurus. Here’s C6 from the same specimen, in anterior view. For this shot I put a thin sheet of foam over the centrum so that I could put the neural arch in anatomical position and see how the whole vert (minus cervical ribs, which form separately and fuse even later) would have looked. Same vert in left lateral view. Compare to the first picture above to see how the rough patches on top of the centra match the shape of the corresponding patches on the neural arch. Here are C7 and C8 in right lateral view. The neural arches and centra are preserved together, but the sutures are still plainly visible. Had this individual lived longer, the neural arches and centra would have grown together, and the sutures would have been gradually erased by bone remodeling. Forensic anthropologists usually divide vertebrae into three bins based on neurocentral suture closure: unfused (1 above), fusing (2 and 3), and fused and obliterated (4). The problem is that you can’t really tell 2 and 3 apart based on external examination; a vertebra with a visible suture might be pretty well fused or it might be held together by only a handful of tiny bars of bone. X-rays or histological sectioning can solve the problem, but usually it’s not warranted; those tests cost time and money and the human skeleton has many other and better indicators of age. For paleontologists the problem is even worse, because we can’t tell 1 apart from 2 or 3. 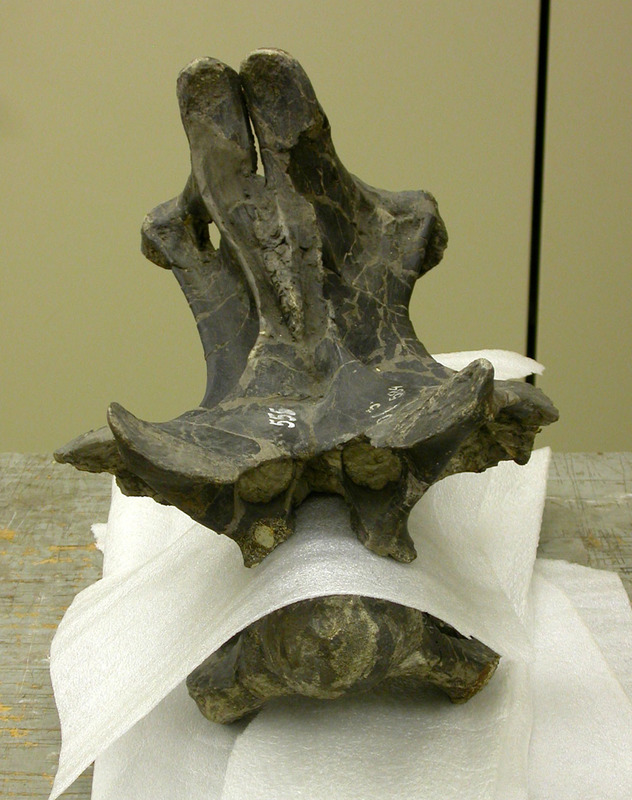 A vertebra with a visible suture line might not be fused at all; the centrum and arch might just be preserved in full articulation. The c7 and C8 shown above could be in 1, 2, or 3; without cutting them up it’s probably impossible to say. I doubt that even the current generation of medical CT scanners could resolve the sutures–which are convoluted in all three dimensions and probably packed with dense matrix–well enough. If there is no trace of a suture we say that it is closed or fused, and if the suture is visible (or if the arch and spine are preserved as separate pieces, as in C6 above) we say that it is open or unfused. Actually there is a step 3.5 in the list above, a partly obliterated suture, in which the suture line is visible along part of its length but obliterated elsewhere. These don’t turn up very often–that is, every vertebra goes through a stage like that, but it is evidently pretty brief compared to the other stages because you don’t often come across vertebrae in this condition. Brochu (1996) showed a couple in croc vertebrae, but I’ve never seen one in a sauropod. There is a final complication, which is that fusion of the neurocentral sutures usually proceeds along the vertebral column like a wave. In some tetrapods in starts in the neck and goes to the tail; in some it goes from tail to neck; in some it starts in the middle and goes in both directions; and in some fusion starts in more than one place. A little work has been done on this in sauropods, but I’ll save that for another post. If you’d like to read up on it in the meantime, see Brochu (1996) and Irmis (2007). The upshot of all of this is that if you find a sauropod centrum with no arch, or vice versa, you can be sure that the animal was not fully mature. Centra are pretty close to being cylindrical, which is a good shape for surviving the ravages of taphonomy. Neural spines are not, and they fragment pretty easily. There are a lot more juvenile sauropod centra with no arches, both in the ground and in museums, than there are arches with no centra, although I have seen a couple of the latter so they do exist. Whew! If you made it this far, thanks for sticking around for the long anatomy slog. It’s all groundwork for talking about baby sauropod bits, so your diligence will be rewarded. Stay tuned, true believers. 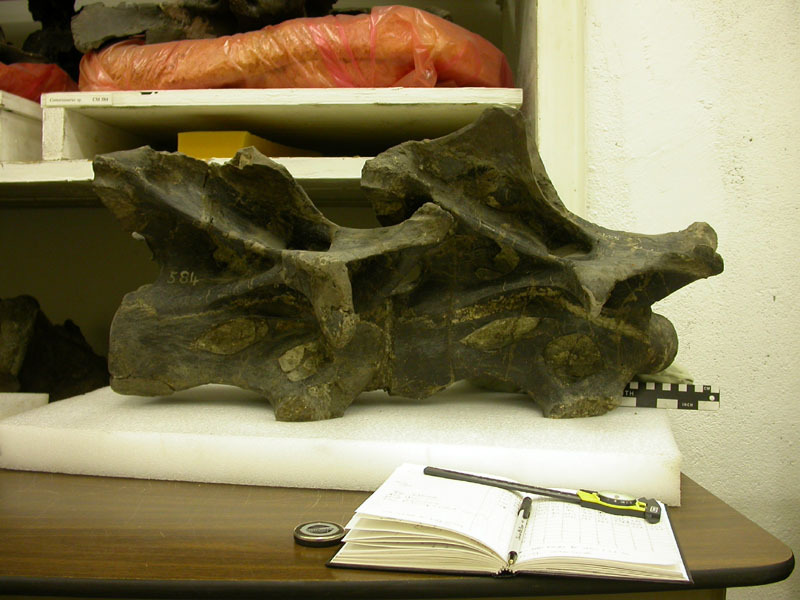 All the vertebrae shown in this post are cervicals of CM 555, from the Carnegie Museum in Pittsburgh. Brochu, C.A. 1996. Closure of neurocentral sutures during crocodilian ontogeny: implications for maturity assessment in fossil archosaurs. Journal of Vertebrate Paleontology 16:49-62. Irmis, R.B. 2007. Axial skeleton ontogeny in the Parasuchia (Archosauria: Pseudosuchia) and its implications for ontogenetic determination in archosaurs. Journal of Vertebrate Paleontology 27:350-361. I’m disappointed to see no comments. Neurocentral sutures are clearly the coolest thing ever in relation to vertebrae. They certainly trump all those stupid laminae. You mentioned that there is a little works on this matter in sauropods. Would you please tell me something about them? I´m working on my PhD with an inmature titanosaur and I´m exploring the neurocentral fusion along the vertebral serie, so those references will be very usefull. The only person that I know of who has published anything on neurocentral sutures in sauropods is Takehito Ikejiri. He had a poster on the subject at SVP a few years ago, possibly 2002. And he has a paper on sauropod ontogeny in the Thunder-Lizards volume from Indiana University Press, which might have something on it. Sorry to not give actual references or better information–I’m in the middle of moving and all of my stuff is packed away. Best of luck with your research! Thank you very much for your response. I´m now in contact with Ike, and I will discuss with him some of this matter. Later I will write you some conclusions if we can get them! me again. Can you tell me in which tetrapod I can find neurocentral fusions starting in more than one place at the same time, as you mentioned? I’m sorry, I don’t remember, and the relevant papers are still packed up because I just moved. If you haven’t already, you might check the papers by Brochu and Irmis on neurocentral suture closure and see who they cite. Sorry to be so useless, I am slammed at work right now and will be for the next 5 weeks.